My daughter has very recently discovered LEGO, I now know the joy of having to fish tiny little LEGO pieces out of the hoover on a daily basis. 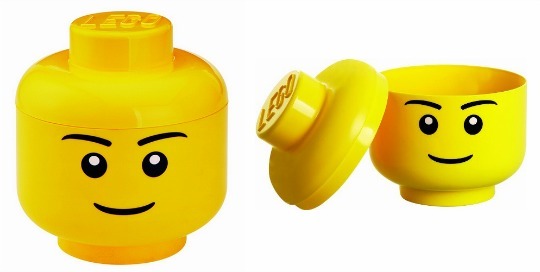 I have been looking for some storage boxes for all the new LEGO and really like the Storage Heads but not the price! However Smyths are currently selling the Small Storage Head's in their 2 for £15 promotion. They are on offer individually for £9.99 each at Smyths but they normally retail up to £11.99 elsewhere. A great feature of this range is the fact that all the Storage Head's stack together, great for saving space and also fun for little one's to play with. They are a brilliant way of storing all those tiny pieces of LEGO that end up embedded in the carpet and yet they still manage to look pretty cool on the bedroom shelf. At this price they are a perfect gift to give alongside a set of LEGO at Christmas. Home delivery is from £2.99 or is FREE if you spend over £29. Or you can choose to Click and Collect for FREE to your local store.